"What is my average trade expectancy?" Successful trading strategies have positive expectancy. The Expectancy Tool analyzes your historical trading results and determines your overall expected return in dollar per dollar at risk. It is vital that your Avg. Trade Expectancy be positive otherwise your system will fail. The Avg. $ Win and Avg. $ Loss is your Avg. $ trade Win (profit) and $ Loss for your trading system’s history. 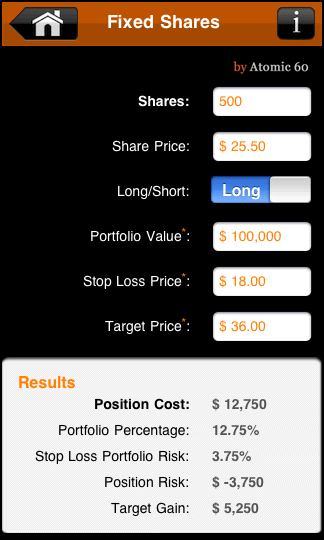 This tool is extremely important for system traders as any profitable system must have positive expectancy. A minimum of 100 historical trades is recommend for accuracy. 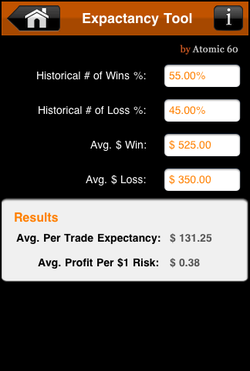 Let’s say my trading results in 50% Historical Wins to 50% Historical Losses. However, my Avg. $ Win is $15 while your Avg. $ Loss is $10. This would result in an overall Avg. Per Trade Expectancy of $2.50. This is good. This means that my system gains an avg. of $2.50 per trade or about $0.25 per dollar at risk. Very good.